SEOUL/WASHINGTON–U.S. President Donald Trump said he was prepared to meet North Korean leader Kim Jong Un for the first U.S.-North Korea summit, marking a potentially dramatic breakthrough in nuclear tensions with Pyongyang. Kim has “committed to denuclearization” and to suspending nuclear and missile tests, South Korea’s National Security Office head Chung Eui-yong told reporters at the White House on Thursday after briefing Trump on a meeting South Korean officials held with Kim earlier this week. Chung said Kim had expressed eagerness to meet President Trump as soon as possible. Trump has now agreed to meet with Kim by May. Asian stock markets responded positively to the news, with Japan’s Nikkei climbing 2.3 percent. South Korean stocks were enjoying their best day since May, up 1.8 percent, while the dollar rose against the safe-haven Japanese yen. A meeting between Kim and Trump, who have exchanged insults that had raised fear of war, would be a major turnaround after a year in which North Korea has carried out a battery of tests aimed at developing a nuclear-tipped missile capable of hitting the U.S. mainland. 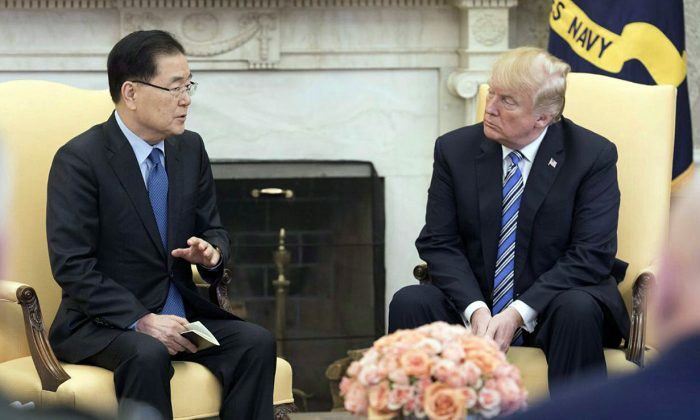 Trump’s aides have been wary of North Korea’s diplomatic overtures because of its history of reneging on international commitments and the failure of efforts on disarmament by the administrations of Bill Clinton, George W. Bush and Barack Obama. South Koreans responded positively to the news, with online comments congratulating President Moon Jae-In for his role in the Trump-Kim talks. Some even suggested Moon should receive the Nobel Peace award, although scepticism over previous failed talks remained. North and South Korea are technically still at war after their 1950-53 conflict ended in a ceasefire, not a truce. Daniel Russel, until last April the assistant secretary of state for East Asia and the Pacific, the most senior U.S. diplomatic position for Asia, said he wanted to see detail and hear from North Korea on the plans. A senior administration official told Reuters Trump had agreed to the meeting because it “made sense to accept an invitation to meet with the one person who can actually make decisions instead of repeating the sort of long slog of the past”. “President Trump has made his reputation on making deals,” the official said. Republican Senator Lindsey Graham said Trump’s firm stance on North Korea gave the best hope in decades to resolve the threat peacefully. In what would be a key North Korean concession, Chung said Kim understood that “routine” joint military exercises between South Korea and the United States must continue. Pyongyang had previously demanded that such joint drills be suspended in order for any U.S. talks to go forward. Trump has derided the North Korean leader as a “maniac”, referred to him as “little rocket man”, and threatened in a speech to the United Nations last year to “totally destroy” the Kim regime if it attacked the United States or one of its allies. Tensions over North Korea rose to their highest in years in 2017 and the Trump administration has warned that all options are on the table, including military ones, in dealing with Pyongyang, which has pursued its weapons programs in defiance of ever tougher U.N. sanctions. Signs of a thaw emerged this year, with North and South Korea resuming talks and North Korea attending the Winter Olympics. During the Pyongyang talks this week, the two Koreas agreed on a summit in late April, their first since 2007. “Japan and the United States will not waver in its firm stance that they will continue to put maximum pressure until North Korea takes concrete action towards the complete, verifiable and irreversible end to nuclear missile development,” Prime Minister Shinzo Abe told reporters in Tokyo. South Korea’s Moon has said sanctions should not be eased for the sake of talks and nothing less than denuclearization of North Korea should be the final goal for talks.